12/4 BX AC cable features aluminum armor to withstand harsh environmental conditions. 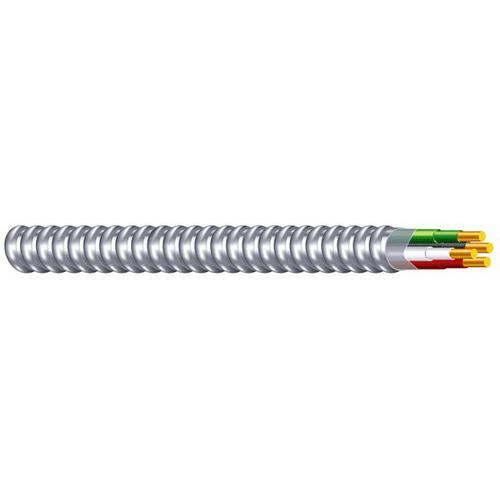 This copper cable with 0.505-Inch OD, has current rating of 25-Amps at 75 deg C and 30-Amps at 90 deg C. THHN/THWN insulation of this cable resists electrical leakage and offers protection against environmental threats. This 250-ft cable comes in a coil. It is suitable for branch circuits in residential, commercial, industrial and non-patient care areas/spaces. Cable is UL listed, RoHS compliant and NEMA rated.